The lamestream media just can’t help but drool over Obama. 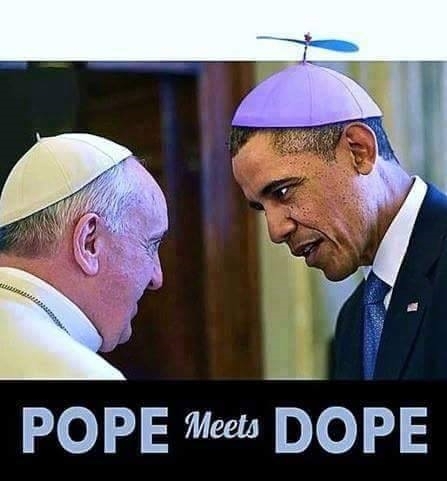 Comparing Barack Obama to the Pope and his humility though, might just be going too far. They have climate fluctuation theory in common. You have to take it to at least 6 degrees. Keep going, don’t give up so easy. You’ll run right into socialist in just a few more. With the exception of supporting income redistribution, the climate change hoax, and Marxism, they don’t have all that much in common. I was waiting for this comparison, and now it’s out. The only thing missing is another Halo picture behind Dear Leader to complete it. Is it just me or does it seem that this POS has been POTUS for 50 yrs? Can anyone truly be this bad and corrupt all in one? What a worthless little man. He’s almost ruined this country in 7 yrs. Can’t wait for Nov. 2016 when the American silent majority will rise up and start the turn around.